From pricey entertainment to panhandling, the motorsports industry is pulling out all the stops this weekend as blue chip marketers descend on Indy. It starts at the one of the city's busiest locations with Don Schumacher Racing and John Force Racing cars on display as VIP's touchdown at the airport. On the trip from the airport, VIP's and fans will probably notice Indy cars painted with NFL team designations. The Super Cars program is showcasing 33 Indy Cars at strategic locations throughout the city, with 32 cars representing each NFL franchise team and one car representing Super Bowl XLVI. The Super Bowl Host Committee has partnered with FourSquare to encourage venue “check-ins" at each of the cars. Meanwhile, in between parties some clients with healthy expense budgets are looking to cement relationships at the Indy Racing Experience, which lets you drive around Indianapolis Motor Speedway's famed track. It comes at a cost -- about $500, but relative to what's typically spent on Super Bowl hospitality it will probably pass on expense forms. On the other end of the spectrum, there's Brandon Reed. 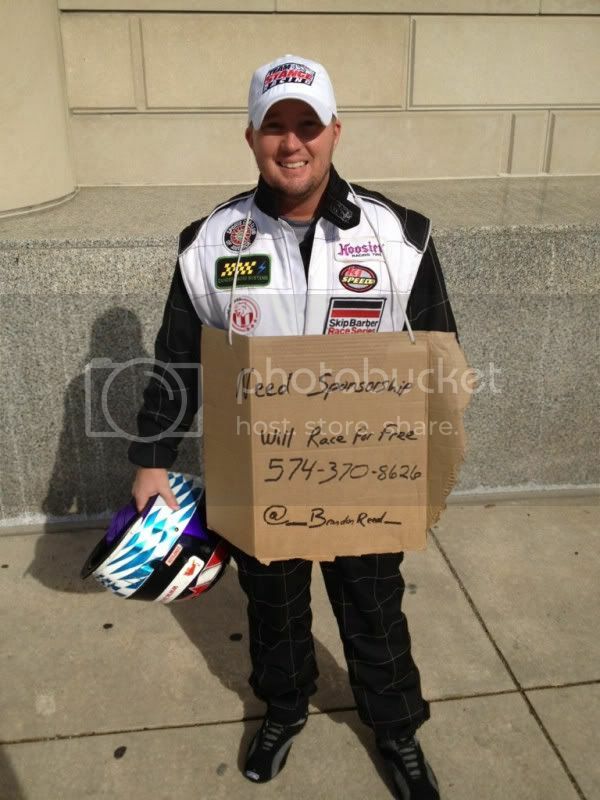 You might have seen him downtown yesterday in full racing uniform, with cardboard sign to boot.